You are here: Home / Facebook / Can Facebook Unseat Google? Over the years, marketers have speculated over who would become the next Google. I’ve even wondered that myself, positing that Bing could overtake Google in a few years. But the next Google killer may not even be a search engine. Facebook made a couple announcements recently that indicate they’re ready to take a whack at Google. One is Instant Articles,where publishers can post original content directly to Facebook. More importantly, though are the related implications for search on Facebook. Everything above the fold is shown here – a generic article about Restaurant Week (shown twice) and a bunch of random trending articles. No Thai in sight. Facebook got the location right – the content is related to the city I searched for – but the details are sorely lacking. But what if Facebook can improve relevance? If I wanted to get Thai food, I might write a Facebook post asking my friends to tell me about their favorite local Thai restaurant. Sure, I could search Google for the same thing, but what is Google missing? Trusted recommendations from people I know personally. All the review extensions in the world don’t equal the recommendation of a few friends. And people hang out for a long time on Facebook. “Facebook accounts for nearly 20% of time people spend on mobile devices,” according to Fool.com. People are spending nearly 3 hours a day on mobile devices, so 20% of that is more than half an hour a day. I don’t know anyone, aside from search marketers, who spends half an hour on Google. Normal, non-SEM people go to Google, perform a quick search, and leave. It’s like going to the gas station. It’s not done for fun, it’s done for necessity – a specific task you need to perform on your way to other tasks. Gas is a commodity. So is search. But Facebook is like the party you’re headed to after you get gas. It’s the destination. All your friends are there. You can interact with them. It’s a two-way conversation. Google doesn’t interact with you any more than the “pay outside” gas pump does. Facebook is way more fun. And that’s what should keep Google up at night. He’s right about the recommendations, but I disagree with him that no one else can answer the questions. 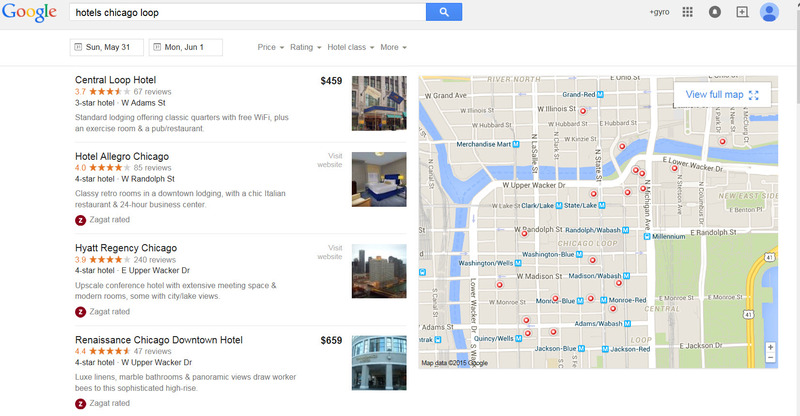 For example, Google has built, and is beefing up, a robust travel search engine. This rivals any search I’ve done on Expedia or TripAdvisor – in fact, it’s a bit better with the map right next to the results. Not every hotel shows a price, but you can easily go to their websites directly, where you’ll often find the same or better prices than on one of the online travel aggregators. In addition to a great results page, Google recently announced that they will be adding hotel ads that allow users to book rooms without ever leaving Google. Hard to imagine Facebook rivaling that any time soon, although it’s certainly possible. 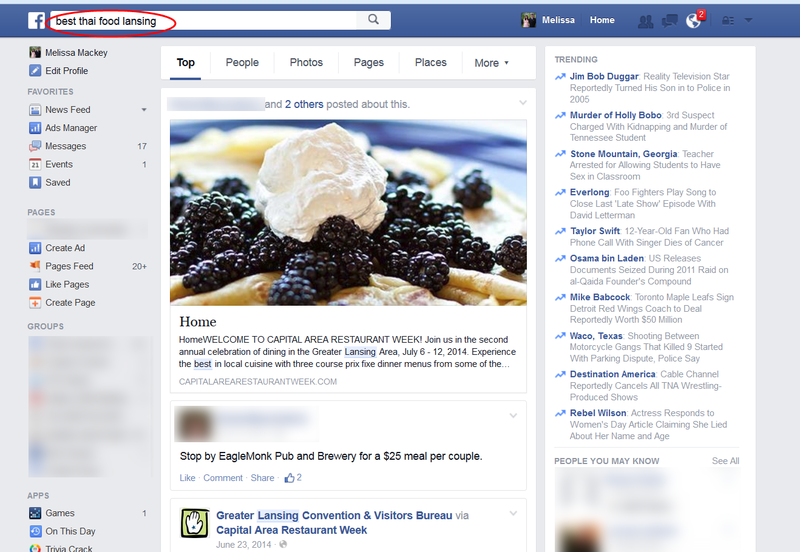 Local search could be a sweet spot for Facebook, though. Facebook’s new Hello app allows users to search for businesses by name, or do category searches for services like plumbing or restaurants, and then call them directly from Facebook. Google has had local search capabilities for a long time, of course, but again, it lacks data from the social graph in the form of recommendations and ratings from your friends. If Hello takes off, it could hurt Google in the local space. Facebook has billions of users – in fact, Facebook is the biggest “country” on earth. While Google handles billions of searches every day, users don’t hang out there; and Google lacks a footprint in countries like China and Russia, where other search engines are more popular. It’s where you go for recommendations anyway. Not a day goes by that I don’t see a friend asking for help or recommendations on Facebook. There are countless industry and private groups talking about topics and making recommendations to one another. Sorry Google, but this isn’t happening on any kind of scale at Google+. Businesses have a relationship with FB users. Businesses might even be more invested with Facebook than individuals are. How many businesses do you follow on Facebook that you feel connected to? Probably a lot. How many businesses do you find in Google that you feel connected to? If there are any, you’re probably connected to them because of Facebook, not Google. So should we all hang up our Google hats and run to Facebook? Not so fast. People aren’t used to searching on Facebook. And, as mentioned earlier, the current search experience there is terrible. Facebook is going to need a lot more than Instant Articles to be a formidable player in search. Every time Facebook updates their news feed algorithm, people have a fit. News feeds get filled with sponsored promos from businesses, Buzzfeed articles, and what seems like anything but updates from your actual friends. Now, of course Google’s not exempt from bias – ever heard of Panda and Penguin? But here’s the difference – when Google updates its search algorithm, SEOs complain; when Facebook updates its algorithm, EVERYONE complains. Instant articles may be cool for getting news stories shared, but news is only one part of the content served by search engines. Search engines don’t wait for content to come to them – they go out and find it. With Facebook, I envision Instant Articles as “articles from those who have the time and money to publish a bunch of stuff.” Not exactly a representative or relevant sample. And anyone who’s read their Facebook news feed knows that the more popular posts, as measured by likes, shares, and comments, show up first in the feed – even if you have your feed set to “Most Recent.” It’s a popularity contest, not a relevance contest. Facebook has relationships, but Google converts. We can’t discount results – that’s the bottom line, after all. Nearly every business I know that does both search and social gets significantly more sales and conversions from search than from social media like Facebook. Facebook has great reach, but search gets results. And what about Instant Articles? 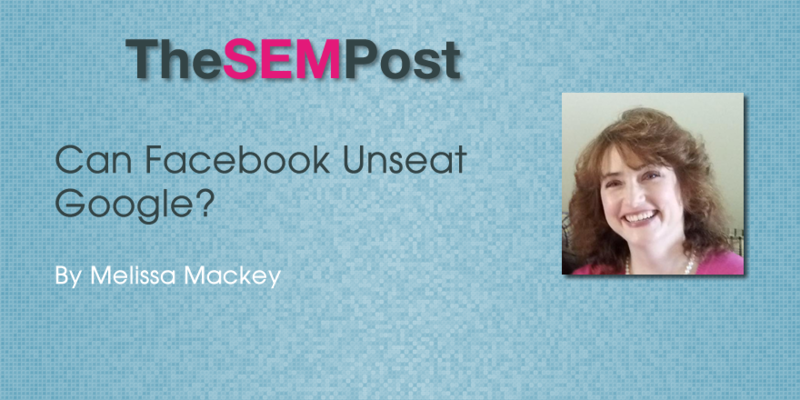 Will adding a bunch of original content make Facebook a more desirable search destination? LinkedIn tried the same thing with Publishing, but that quickly lost its sheen. Then again, LinkedIn doesn’t have the user base or staying power of Facebook. Here’s a bigger question, though: Why would organizations publish their content on Facebook instead of their own sites? I think that’s part of the issue with LinkedIn Publishing, at least for me: why would I write a great post and then have it live on LinkedIn instead of an industry site or my own blog? For businesses, why would they invest effort in publishing – which is hard for so many businesses as it is – directly on Facebook and not on their own website? What happens when Facebook decides to bury – or worse, delete – your content? What recourse do you have? Big considerations, to be sure. So will Facebook unseat Google? Maybe. Will it happen soon? Probably not.